This is the time of year where I've fully transitioned into spring and summer colors. No more neutrals no more dark colors. I'm a very seasonal nail polish person. I don't match my nail polish to the season because I feel like I have to. I just really like to! We don't really have seasons in Florida, so changing up my color palette seasonally is the only way I really feel like the year is going by. Plus, I don't really feel like wearing dark vampy colors in April or neon yellow in November. This OPI throwback has been a go-to polish for me the past two years. Feel the Mo-heat-oes is a pastel mint green creme. Color: I love this shade of mint because it's really unique to my collection even though I have plenty of mint greens. 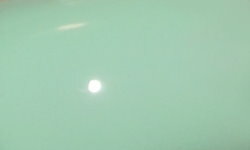 This one is more of a true mint green in my opinion because it leans almost exclusively to the green side and doesn't really have any blue undertones. Formula: The formula on this polish is excellent especially for being a pastel shade. I was surprised. I used 3 coats. Price: This was a set sold exclusively to CosmoProf stores for licensed beauty professionals only. I'm not one of those, but I got this on eBay at the time. I still see this available on e-tailers in this $10-$20 range. It's a bit pricier because of it's exclusivity. Overall: This is definitely one of my favorite greens. My only complaint is the name. The name is great, it's just a PITA to type and remember where the hyphens go. First world problem, I know! Besides that, it's a great color. I love the formula and it's one of my favorite OPI polishes. OPI She's A Bad Muffuletta!